MLB Today: Is Dustin Pedroia in Line for Another MVP Award? Dustin Pedroia is putting up better numbers than his MVP season. 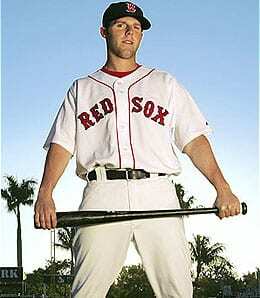 Remember back in late-May when Dustin Pedroia was struggling? Well, he sure as hell has turned things around, hasn’t he? He hit .340 with an OPS of 1010 in June, mashed to the tune of a .411 BA in July with six steals and a slugging percentage of .752, which is an MLB season high for any month this year. Oh, and after smacking another pair of hits Friday – including a double – and adding his career-best 23rd steal of the season – he’s now hitting a robust .325 so far in August. It seems to me that once the Little Pony really got rolling, so did the Red Sox, making him a prime candidate for the MVP award for my money. His overall numbers are better than what he put up during his 2008 MVP season. Of course, Pedroia’s own teammates Adrian Gonzalez and Jacoby Ellsbury may have something to say about that, as there’s no shortage of possible award winners in the BoSox lineup. One team that doesn’t have to worry about identifying MVP candidates is the Houston Astros. Brad Mills’ squad has now lost four straight games, dropping 13 games behind the fifth-place Cubs and a whopping 30 games back of the pace in the NL Central. It’s the furthest the team has been out of first since the penultimate game of the 1991 season. Toppling the franchise record (43.5 games back in 1975) is a realistic possibility. Friday night, Houston suffered its 81st loss of the season, meaning it needs to win its final 43 games to reach .500. Um, ya. By far the worst team in baseball this year, it’s reasonable to wonder if the ‘Stros will even reach 50 wins. Any way you slice it up, it’s a miserable time to be a fan of the Astros. They have dropped 16 of their last 19 road games and are one of only four NL teams that does not have a double-digit win pitcher. This entry was posted on Saturday, August 13th, 2011 at 1:30 pm	and is filed under BASEBALL, MLB Today, RotoRob. You can follow any responses to this entry through the RSS 2.0 feed. You can leave a response, or trackback from your own site.